A recipe for apple cider braised pork roast. 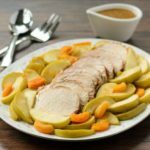 A boneless pork roast is slow-simmered in apple cider with onions then finished with tart apples and apricots. Heat oil in a 6- to 8-quart Dutch oven until almost smoking. Brown pork on all sides in the hot oil. Transfer browned pork to a plate and discard fat. Add apple cider, onion, salt, and pork to the Dutch oven. Bring to a boil then reduce heat to simmer. Cover and simmer until meat is tender, about 2 to 2 1/2 hours. Remove pork and place on a cutting board. Let rest for 10 to 15 minutes. Slice and place on a serving platter. Cover with foil to keep warm. Core apples and cut into wedges. Cut dried apricots in half (if not already in pieces). Add apples, apricots, cardamom, and cinnamon to the dutch oven. Bring to a boil then reduce heat to simmer. Cover and simmer until fruit in tender, about 5 minutes. Use a slotted spoon to transfer apples and apricots to the serving platter. Re-cover with foil to keep warm until serving. Bring the juices in the Dutch oven to a gentle boil and cook until reduced to 1 cup, about 7 to 10 minutes. Spoon cider sauce over meat and fruit or serve on the side.